Hewitt & Bartram - Fruit & Veg MarketHewitt & Bartram - Fruit & Veg on Great Yarmouth market - quality fresh produce at great prices. Keep healthy and indulge in all this season has to offer. We supply mostly local produce with our speciality being soft fruit in the summer. 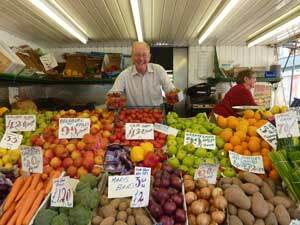 Hewitt & Bartram - Fruit & Veg on Great Yarmouth market - quality fresh produce at great prices. Keep healthy and indulge in all this season has to offer. We supply mostly local produce with our speciality being soft fruit in the summer. You may even recognise Peter from the Treat - shop till you drop video.